We just had a terrific thunderstorm here in Tsukuba. For those of us celebrating the Gion Matsuri Festival in the neighborhood of Konda (金田), and probably for those at the various other local Gion Matsuris in this area, the storm was not only notable for the intensity of its rainfall, its strong winds or its terryfying thunder and lightning. It was the timing of the storm which made it so dramatic. I should even say UNFORGETABLE . At Konda`s Yasaka Shrine, where in the past important rain supplication ceremonies ( amagoi) had often been held, most notably during the Great Famine of Tenmei, and with the Shimada Ishi ( a stone which according to local legend was successfully used to pray for rain) its narrow precincts, the festival drummers were building up into a crazed frenzy. The portable shine( Mikoshi) had just returned from making its rounds and was passing between the onlookers and the drummers. Just at that moment, a stong gust of wind whipped the placed off the tables which had been set up for the post festival feast- and with a flash of lightning- it started to rain. We had enough time, before the drizzle turned to a downpour, to get into the car and drive home. But after the 2 minute drive, the rain had become so intense and the lightning so terrifying that we just waited it out IN THE CAR, for about an hour. I realized that the festival had gone well, celebrated with true spirit- because the God enshrined at all the Yasaka Jinja`s at which the Gion Festivals are held are all dedicated to Susanoo-no-Mikoto- GOD OF THE STORM! These days electrical storms have been occurring so regularly around Tsukuba that you could almost set your watch by them. The lightning flashes begin just after dark and sometimes continue, with remarkable frequency, for hours. Though these nocturnal pyrotechnics can be beautiful to watch from your window, these storms are also quite SCARY (especially for children and dogs) and dangerous. A few years ago as the thunder roared and the lightning seemed to be singling out my neighborhood for special attention, my house filled with acrid smoke. Certain that a thunderbolt had struck and started a fire, I FRANTICALLY ran from room to room searching for the flames, with my dog barking hysterically at my heels. What I found, however, was that smoke was pouring out of my lightning-surge fried computer, which of course had to be trashed. I now run to unplug my computer and television at the first sign of a storm. 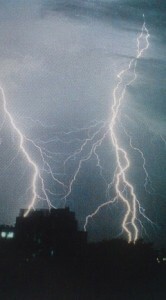 Most Tsukubans these days are quick to attribute the nightly KAMINARI (thunder and lightning) to global warming. In past ages, however, the Japanese would have asserted just as quickly, and with even more confidence, that the thunderclaps and lightning bolts were the work of RAIJIN (the god of thunder and lightning) and his companion RAIJU. You have probably seen some of the famous art works depicting Raijin, an ogre in a tiger-skin loin cloth, holding the sticks to beat his drums, which create the thunderous roar. Raiju on the other hand is usually imagined as a small mammalian hybrid, part tanuki, part cat, part mole. According to folk beliefs, these usually sedate creatures, prefer to sleep within the safe confines of the human bellybutton! When Raijin wants to summon his companion for a storm, he shoots arrows to arouse the little fella and get him out of his warm and snuggly resting place. That is why, to this day, when a storm starts up anywhere in Japan, you might hear parents warning their small kids: “Cover your bellybuttons! He’s gonna get your bellybutton! O-heso kakushitoki na! Torarechau kara ne!” I’ve certainly been hearing this curious expression a lot these days! I’ve even heard that older people turn over on their stomachs if there is a storm while they are in bed at night, just to be on the safe side. It is also very interesting to look at the Japanese words for thunder and lightning. They reveal a great deal about how these phenomena were traditionally viewed. The word for thunder is kaminari, which literally means Kami (god(s)) nari (resounding). Simple enough. More interesting is the Kanji character for that word (雷). Rain over a rice field. This surely implies the belief in the importance of thunder in its connection to the coming of rain and watering of the fields. The word for lightning itself is even more interesting. Inazuma (稲妻) literally means ”rice plant’s wife”! The ancient East-Asian rice cultivators must have believed that lightning was a necessary element in the bringing about of rice. As if the gods, like Dr Frankenstein, used electric bolts to instill life into the inanimate! 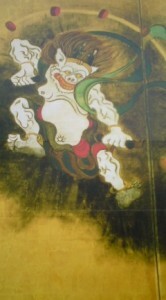 There are numerous shrines throughout Japan dedicated to Raijin. I have written about one shrine in Tsukuba, the Inaoka Kaminari Jinja, which had been used for generations as a place to make supplications for rain. If you’ve got a surge protector, it can also be fun to watch the lightning monitor at Tokyo Electric Power Company’s (TEPCO) website.